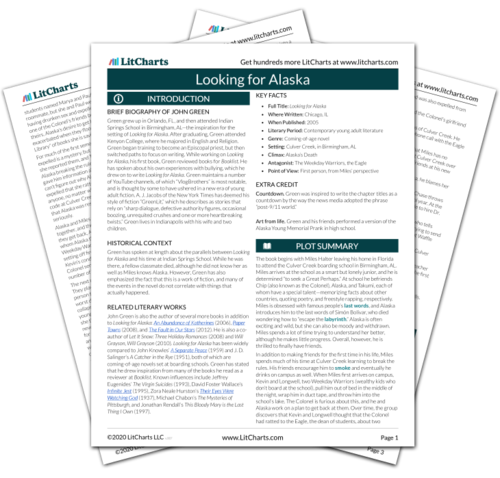 Welcome to the LitCharts study guide on John Green's Looking for Alaska. Created by the original team behind SparkNotes, LitCharts are the world's best literature guides. A concise biography of John Green plus historical and literary context for Looking for Alaska. A quick-reference summary: Looking for Alaska on a single page. In-depth summary and analysis of every chapter of Looking for Alaska. Visual theme-tracking, too. Explanations, analysis, and visualizations of Looking for Alaska's themes. Looking for Alaska's important quotes, sortable by theme, character, or chapter. Description, analysis, and timelines for Looking for Alaska's characters. Explanations of Looking for Alaska's symbols, and tracking of where they appear. An interactive data visualization of Looking for Alaska's plot and themes. Green grew up in Orlando, FL, and then attended Indian Springs School in Birmingham, AL—the inspiration for the setting of Looking for Alaska. After graduating, Green attended Kenyon College, where he majored in English and Religion. Green began training to become an Episcopal priest, but then switched paths to focus on writing. While working on Looking for Alaska, his first book, Green reviewed books for Booklist. He has spoken about his own experiences with bullying, which he drew on to write Looking for Alaska. Green maintains a number of YouTube channels, of which “VlogBrothers” is most notable, and is thought by some to have ushered in a new era of young adult fiction. A. J. Jacobs of the New York Times has deemed his style of fiction “GreenLit,” which he describes as stories that rely on “sharp dialogue, defective authority figures, occasional boozing, unrequited crushes and one or more heartbreaking twists.” Green lives in Indianapolis with his wife and two children. Green has spoken at length about the parallels between Looking for Alaska and his time at Indian Springs School. While he was there, a fellow classmate died, although he did not know her as well as Miles knows Alaska. However, Green has also emphasized the fact that this is a work of fiction, and many of the events in the novel do not correlate with things that actually happened. John Green is also the author of several more books in addition to Looking for Alaska: An Abundance of Katherines (2006), Paper Towns (2008), and The Fault in Our Stars (2012). He is also a co-author of Let It Snow: Three Holiday Romances (2008) and Will Grayson, Will Grayson (2010). Looking for Alaska has been widely compared to John Knowles’ A Separate Peace (1959) and J. D. Salinger’s A Catcher in the Rye (1951), both of which are coming-of-age novels set at boarding schools. Green has stated that he drew inspiration from many of the books he read as a reviewer at Booklist. Known influences include Jeffrey Eugenides’ The Virgin Suicides (1993), David Foster Wallace’s Infinite Jest (1995), Zora Neale Hurston’s Their Eyes Were Watching God (1937), Michael Chabon’s The Mysteries of Pittsburgh, and Jonathan Rendall’s This Bloody Mary is the Last Thing I Own (1997). Art from life. Green and his friends performed a version of the Alaska Young Memorial Prank in high school. Walker, Lanier. "Looking for Alaska." LitCharts. LitCharts LLC, 4 Oct 2015. Web. 20 Apr 2019. Walker, Lanier. "Looking for Alaska." LitCharts LLC, October 4, 2015. 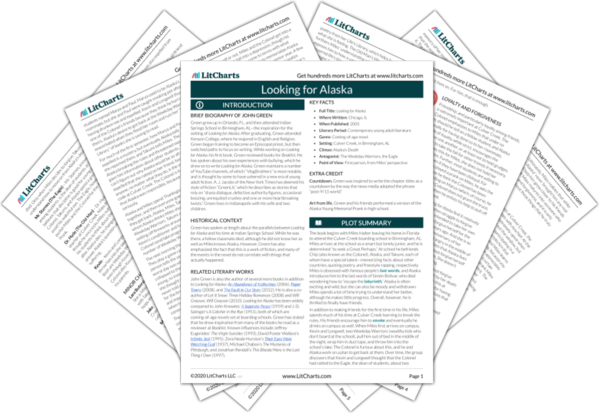 Retrieved April 20, 2019. https://www.litcharts.com/lit/looking-for-alaska.